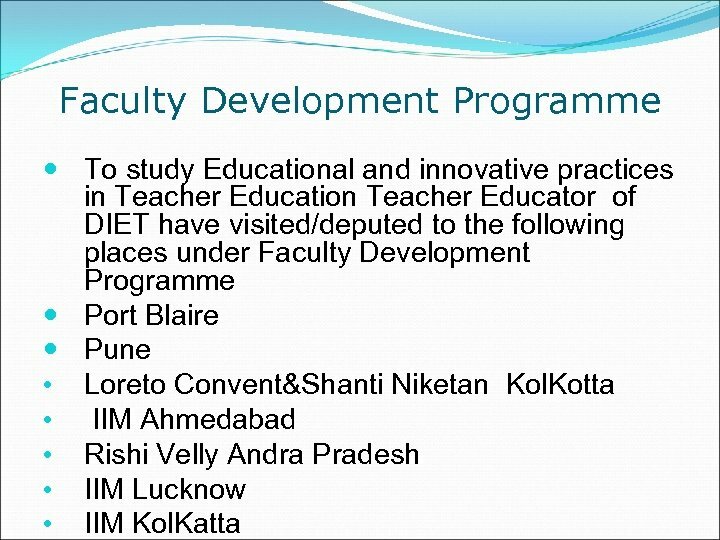 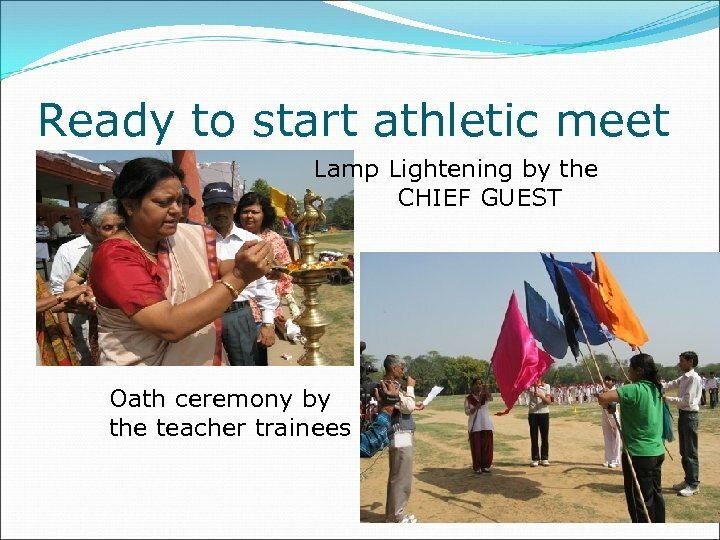 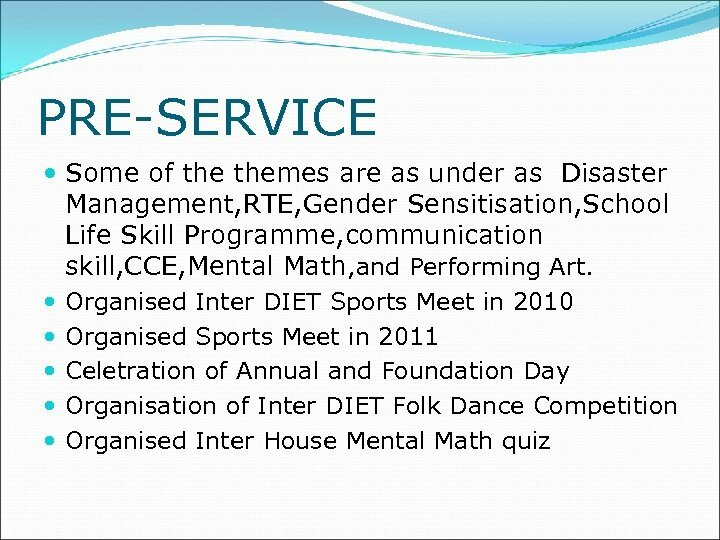 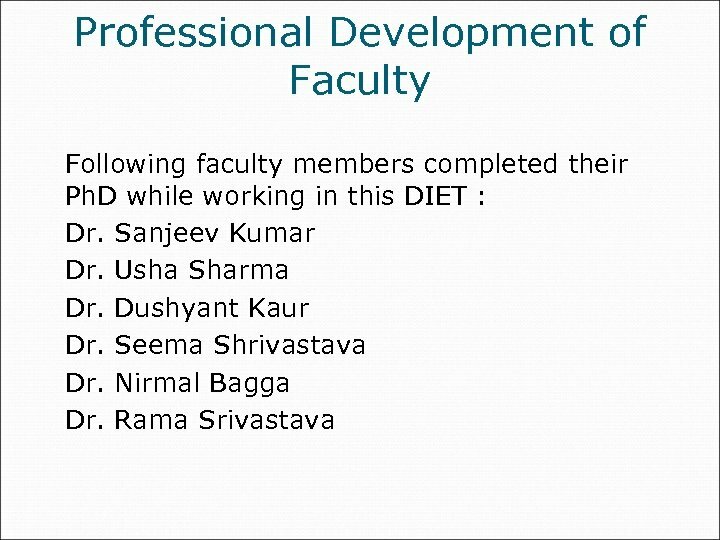 DIET was established in 1989 to cater to the academic needs of South District of Delhi. 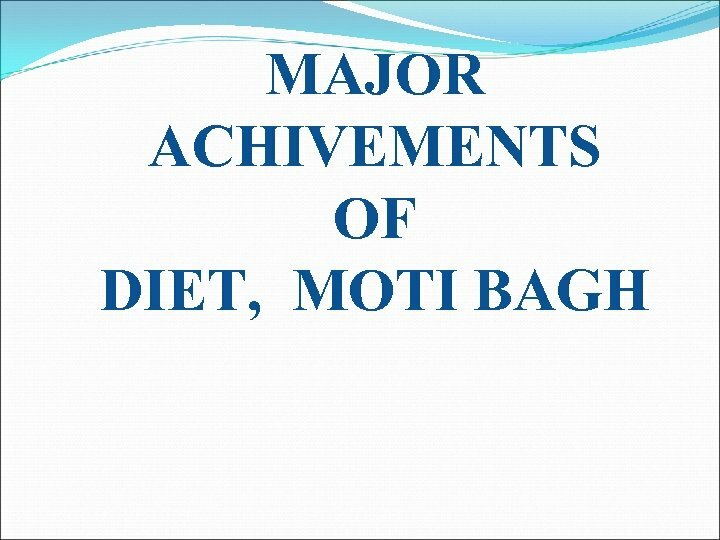 PRE-SERVICE DIET Moti was established in 1989. 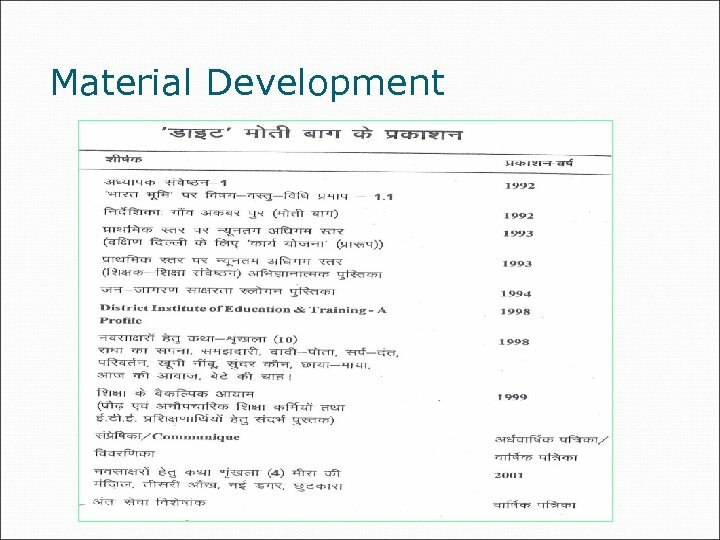 Upto 1995 Annual enrollment was 50. 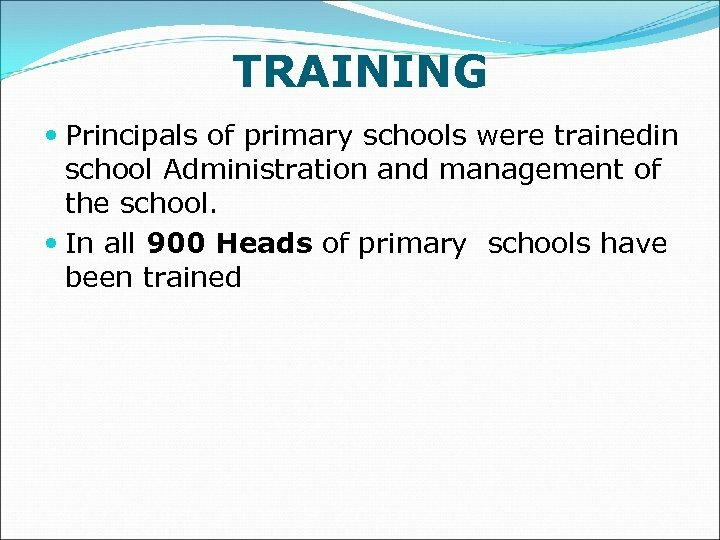 For the next 10 year annual intake increases to 100. 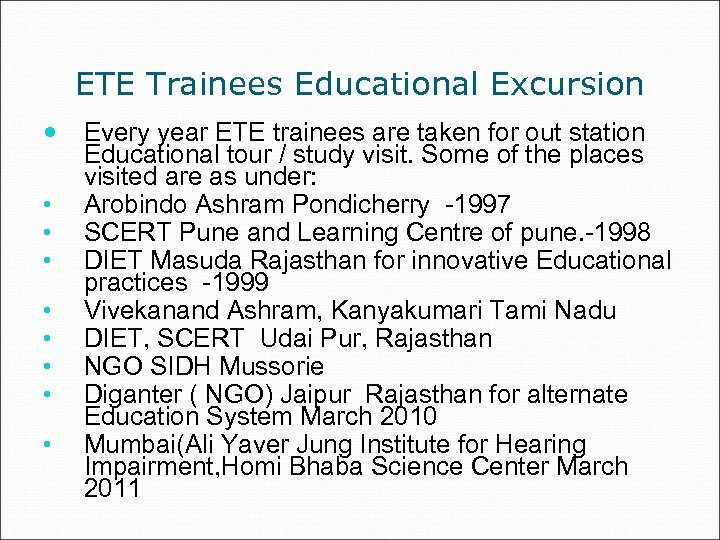 From 2006 onward annual intake of ETE trainees has been increased to 150 In all 1850 ETE trainees have successfully completed the course and professionally trained During the two year training course beside completion of academic activities, workshops were organized on current and national educational issues. 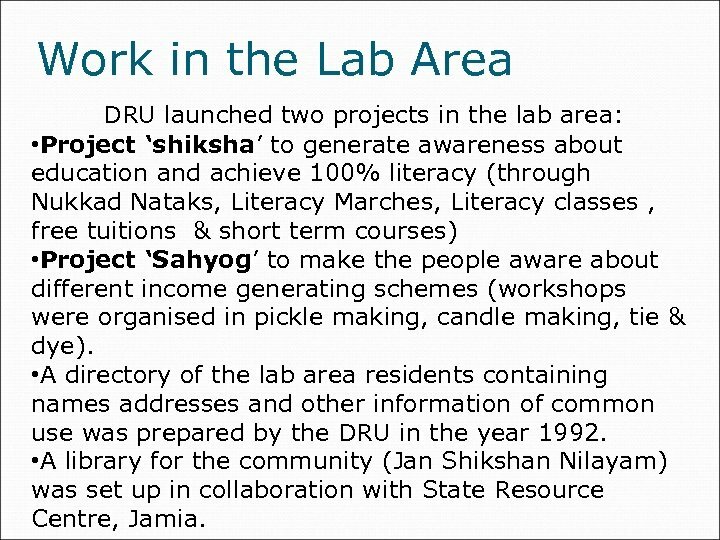 Work in the Lab Area DRU launched two projects in the lab area: • Project ‘shiksha’ to generate awareness about education and achieve 100% literacy (through Nukkad Nataks, Literacy Marches, Literacy classes , free tuitions & short term courses) • Project ‘Sahyog’ to make the people aware about different income generating schemes (workshops were organised in pickle making, candle making, tie & dye). 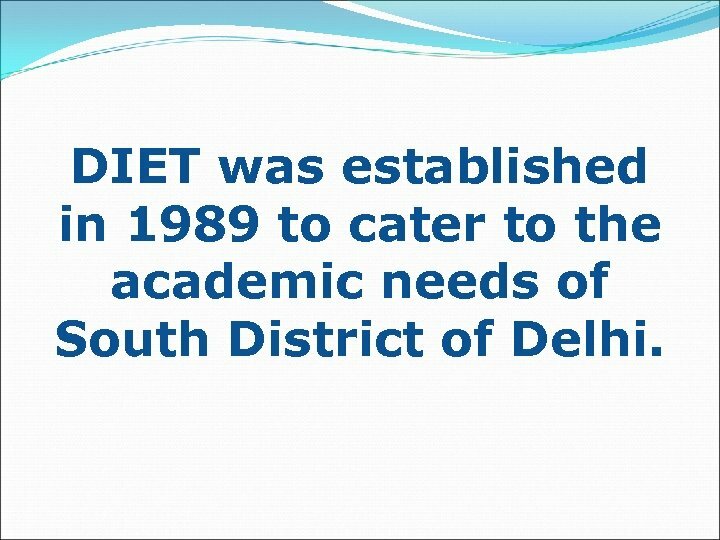 • A directory of the lab area residents containing names addresses and other information of common use was prepared by the DRU in the year 1992. 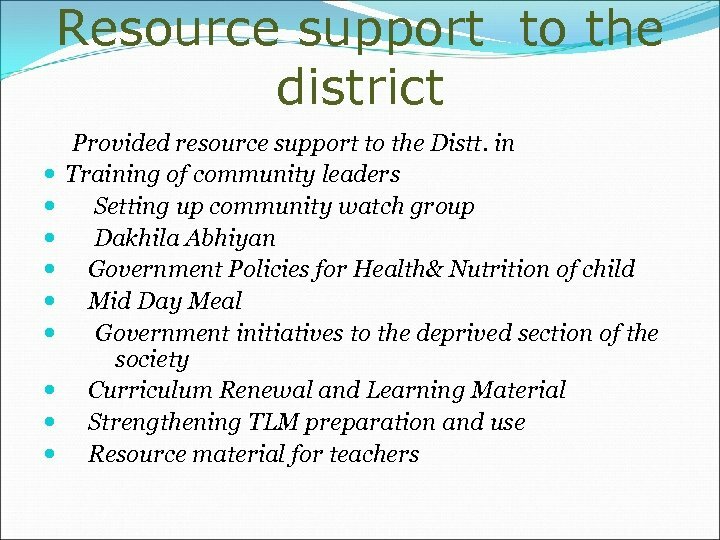 • A library for the community (Jan Shikshan Nilayam) was set up in collaboration with State Resource Centre, Jamia. 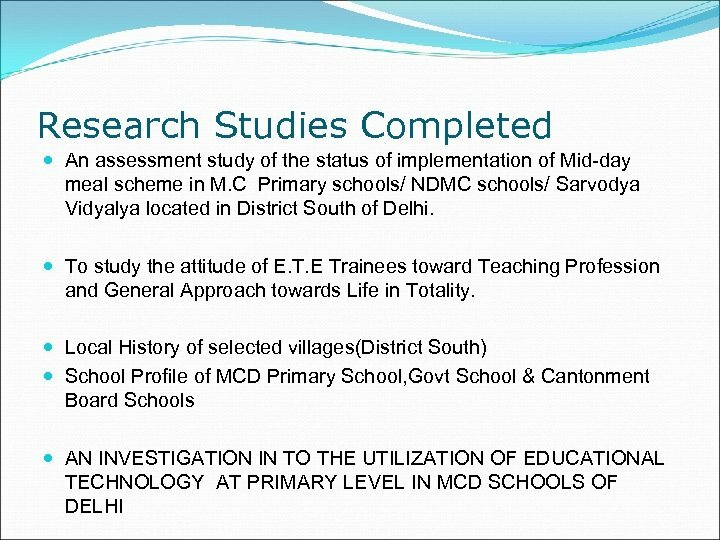 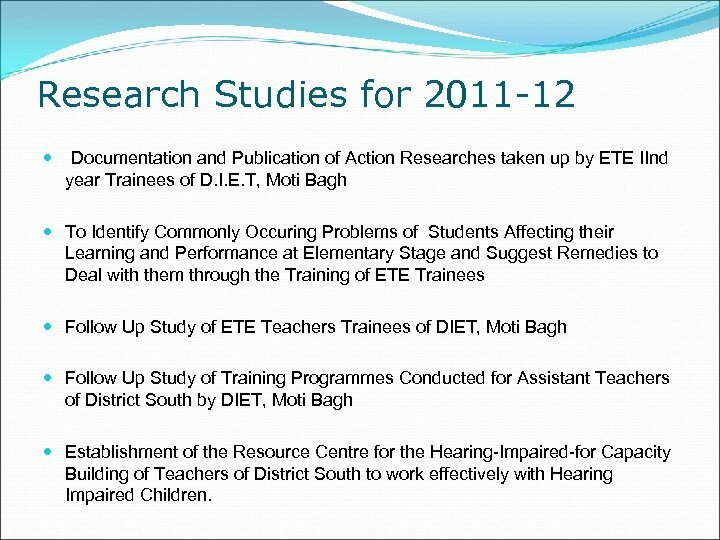 Research Studies for 2011 -12 Documentation and Publication of Action Researches taken up by ETE IInd year Trainees of D. I. E. T, Moti Bagh To Identify Commonly Occuring Problems of Students Affecting their Learning and Performance at Elementary Stage and Suggest Remedies to Deal with them through the Training of ETE Trainees Follow Up Study of ETE Teachers Trainees of DIET, Moti Bagh Follow Up Study of Training Programmes Conducted for Assistant Teachers of District South by DIET, Moti Bagh Establishment of the Resource Centre for the Hearing-Impaired-for Capacity Building of Teachers of District South to work effectively with Hearing Impaired Children. 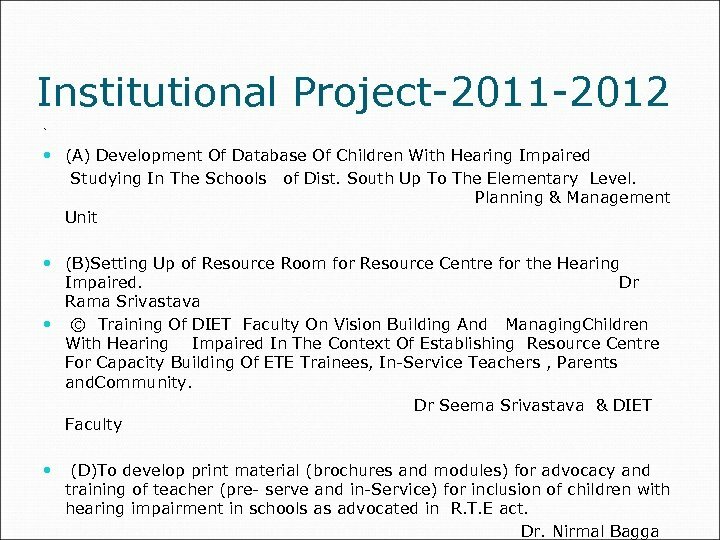 Special Contributions Ø Provided support to NCERT to conduct Evaluative study at Elementary Level Ø Organised and conducted State consultative workshop on draft National Curriculam Framework (NCF), 2005. for school education with children, Teachers , Principal and parents Ø Curriculum Framework (NCF), 2005. 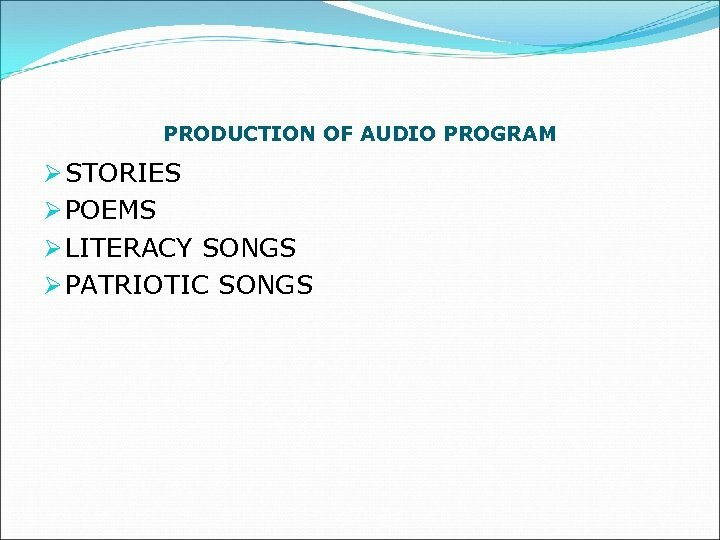 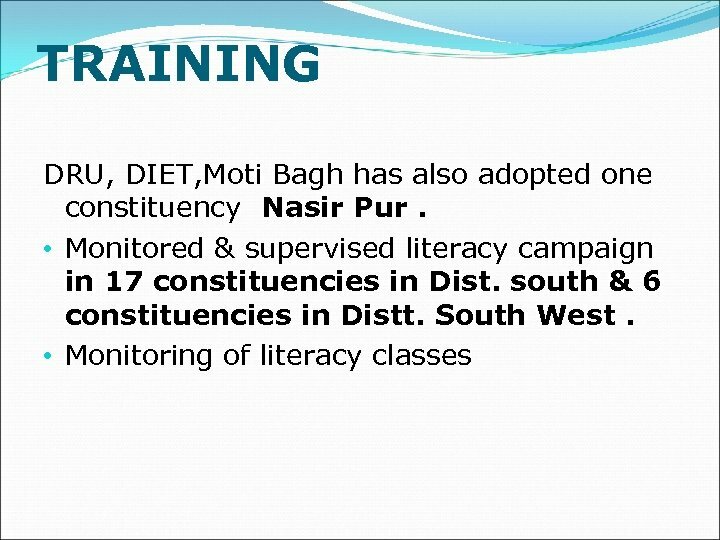 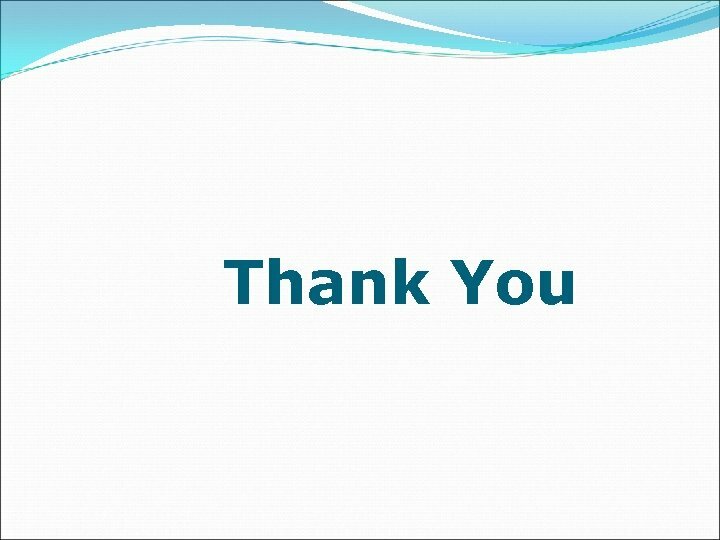 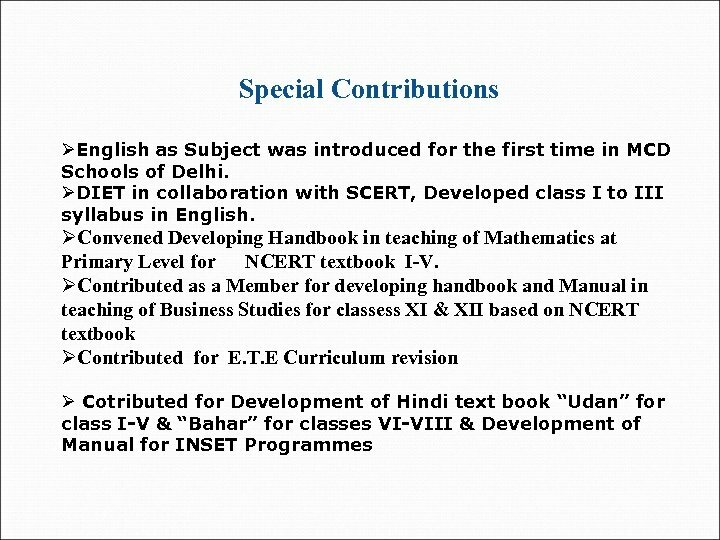 The Teachers Manuals were developed in different subjects which were disseminated during the program. 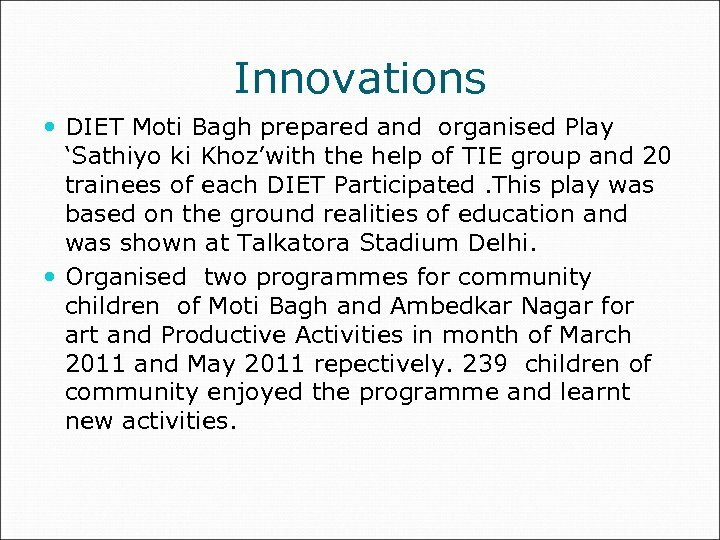 Innovations DIET Moti Bagh prepared and organised Play ‘Sathiyo ki Khoz’with the help of TIE group and 20 trainees of each DIET Participated. 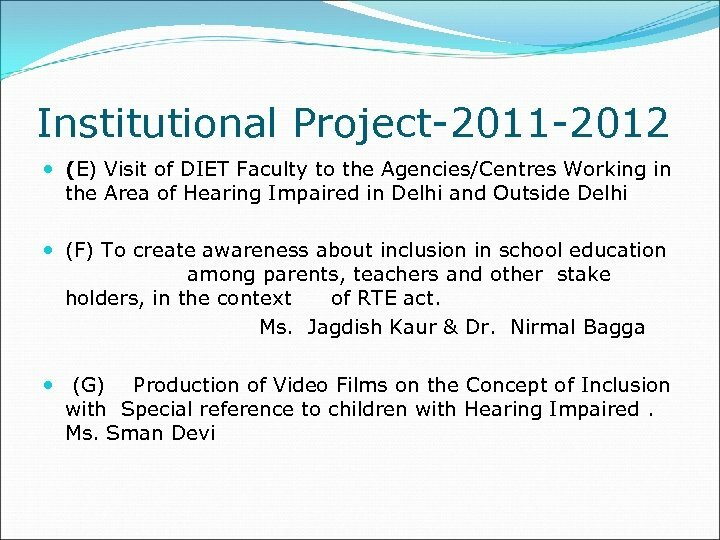 This play was based on the ground realities of education and was shown at Talkatora Stadium Delhi. 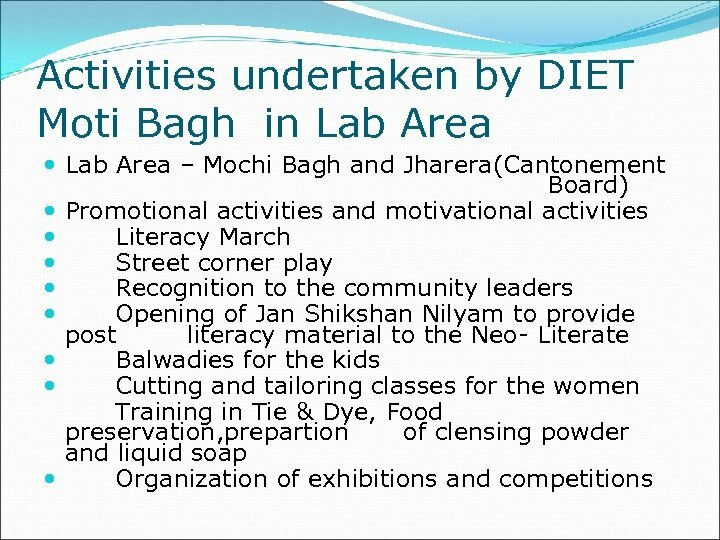 Organised two programmes for community children of Moti Bagh and Ambedkar Nagar for art and Productive Activities in month of March 2011 and May 2011 repectively. 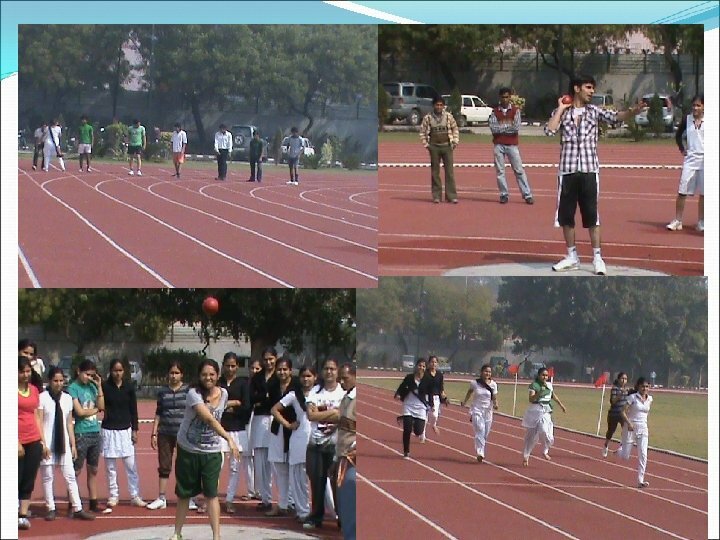 239 children of community enjoyed the programme and learnt new activities.